A muse is something or someone that inspires you to be creative, and bring out your inner talent and feelings. This week, your muse for blogging was our WOW prompt - 'The Muse'. We are quite a'mused with the variety of blog posts we received - from thrilling to sensitive and from prose to poetry. 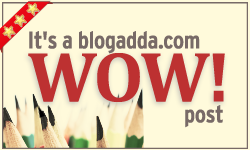 Let's take a look at the blog posts which made it to the final WOW list this week. Congratulations to each one of you! Save this image and flaunt it on your blog post. Keep blogging! Thanks Team Blogadda.. Happy to know this!